A complete service for the player piano. Player piano rebuilding and repair work for all pneumatically operated player pianos, reproducing pianos, nickelodeons, reed organs, band organs and anything else that uses air to create mechanical music. Player systems and components can be shipped to my shop for rebuilding and you can re-install the rebuilt parts yourself. There is no need to send your entire piano if the player action does not work anymore. You can send the player action parts from the piano via UPS. If you would like to send a complete piano or organ for restoration service, easy arrangements can be made to transport your instrument here to the shop. Thanks for stopping by. 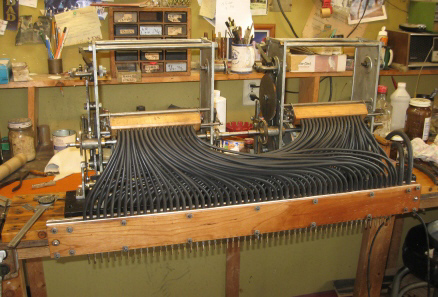 A Standard Pneumatic action- The Standard Pneumatic Action Company manufacturer high quality player piano actions which are the most common player actions found today as a result of their rugged design and reliability. Standard Pneumatic player valves- Here is a look at the valve board during disassembly. The valves are the heart of any player action and proper rebuilding of them is the key to making a player piano easy to pump and fun to play. 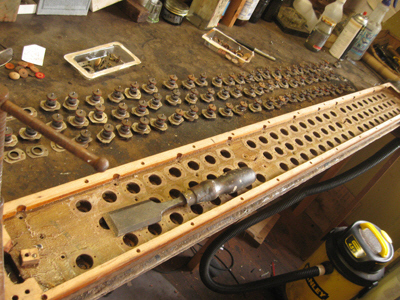 Here is a band organ duplex roll frame on the bench. 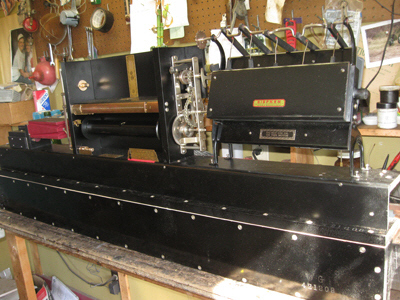 By having two roll frames band organs can play continuously for their most common intended used in a carousel. The wooden unit that the tubes are all leading to is the vacuum operated unit that switches the tracker bar signals from one roll frame to the other. 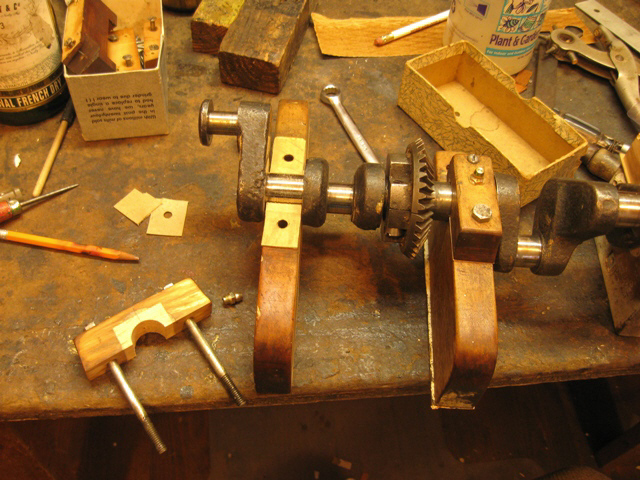 Band organ crankshaft and pillow blocks-This view was taken during the rebuilding of a band organ crankshaft assembly. Unlike most crankshafts which rest on metal pillow blocks this band organ uses wooden pillow blocks which wear with the passage of time. New hardwood is installed during the rebuilding process and then the blocks are line bored and fitted to insure many years of trouble free operation.